In the past, getting a root canal had a reputation for being a painful procedure, but modern technology in the field of dentistry has changed all that! Our root canal dentist at Smile Arkansas can ensure that your root canal is entirely painless, and will help you to minimize any discomfort after you return home, as well. If you feel anxious about your root canal, we also offer relaxation techniques and sedation dentistry options to help put you at ease. At Smile Arkansas, your comfort during a root canal in Little Rock, AR, is as much a priority as your dental health! A root canal is a procedure used to salvage a tooth by removing an infected and damaged root nerve. The surgery involves gently removing the nerve and pulp to prevent further damage to the surrounding teeth and gum. Even though this procedure is referred to as a root canal, the root itself is left intact, while the soft tissue from inside the tooth’s structure gets removed. Some causes of infected pulp include a deep cavity, repeated dental procedures, a cracked or broken tooth, or an injury to the tooth that’s not visible. Most of the time, a root canal in Little Rock, AR, is a relatively simple procedure with little or no discomfort involved. One to three visits to our expert dentist, Dr. Wyant, are typically required. Best of all, it can save your tooth and your smile! If you continue to care for your teeth and gums your restored tooth can last a lifetime. If you find yourself nervous about the prospect of a root canal, let us know! Dr. Wyant and our team always want you to feel comfortable and pain-free, and we will work with you to ensure your entire visit with us is stress-free. For more information on root canals, contact our friendly office today at 501.821.4200 or click here to schedule an appointment. We also invite you to take advantage of our Dr. Wyant Smile Makeover Consultation to see how we can help you achieve your happiest, healthiest smile. 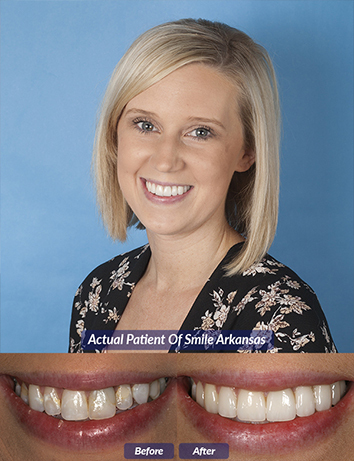 As one of the premier dental practices in Arkansas, our team at Smile Arkansas also provides root canals to patients from Little Rock, Maumelle, Conway, Bryant, Benton, Cabot, Sherwood, Hot Springs, Hot Springs Village, Pine Bluff, Fayetteville, Bentonville, Rogers, Springdale, Russellville, El Dorado, and Camden, AR.